President Kovind's visit to Myanmar aims to continue India's high level engagements with Myanmar under the rubric of 'Act East Policy' and 'Neighbourhood First Policy'. 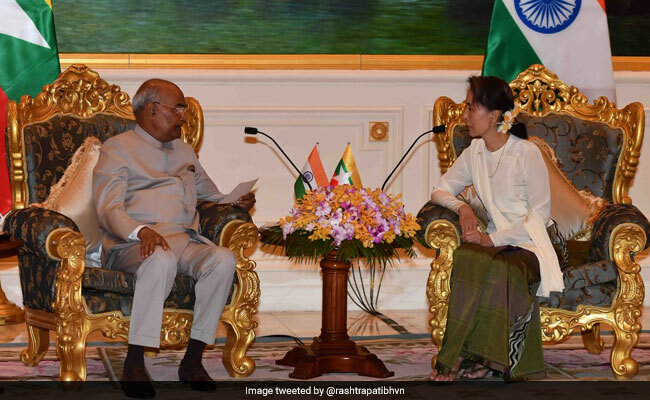 President Ram Nath Kovind with Myanmar State Counsellor Aung San Suu Kyi. To boost people-to-people relations with India, Myanmar will provide visa-on-arrival for Indian tourists, President Ram Nath Kovind said today as he began his five-day visit to the country. "Coinciding with President Kovind's visit, and to further people-to-people relations, Myanmar has also announced a visa-on-arrival facility for Indian tourists entering the country through the international airports of Nay Pyi Taw, Yangon and Mandalay," the president's office tweeted. The President said residents of India's Northeast region have particularly welcomed and are beginning to reap the benefits of the Land-border Crossing Agreement which concluded recently. The landmark Land Border Crossing Agreement between India and Myanmar, signed on May 11, 2018, was brought into effect in August with the simultaneous opening of international entry-exit checkpoints at the Tamu-Moreh and the Rihkhawdar-Zowkhawtar border between the two nations. "They look forward to the early conclusion of the Motor Vehicles Agreement," President Kovind said. Several agreements are expected to be signed during the President's visit. Prime Minister Narendra Modi visited Myanmar last year, while Myanmar's State Counsellor Daw Aung San Suu Kyi visited India in January for the India-ASEAN Commemorative Summit.